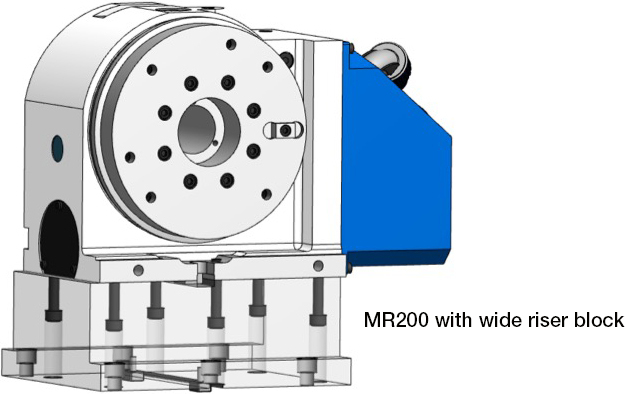 MK200 Rotary table - the start of an upgraded standard series to suit your machine. The clamping torque of the MK200 has improved to 570N.m from the older standard of 350N.m of the MR200 rotary table which is an increase of 40%. 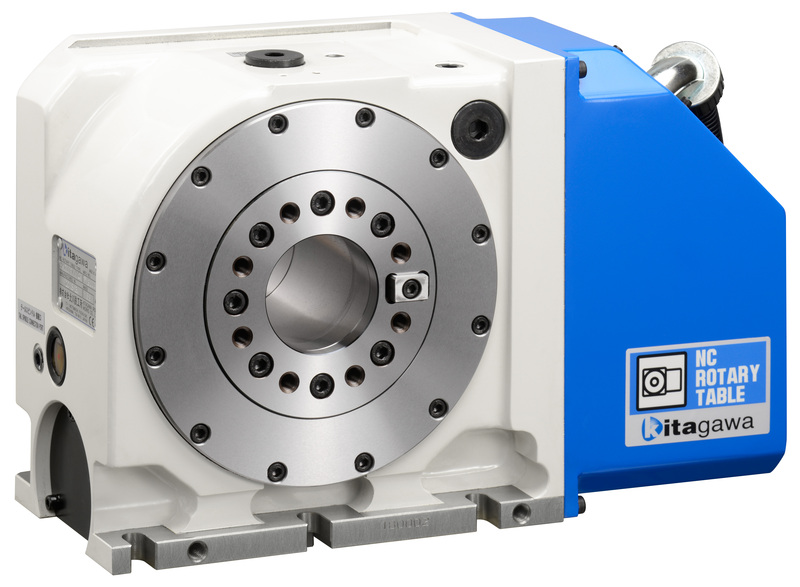 In addition, Kitagawa has made the depth of the rotary table 10% thinner than the previous MR200 Rotary table to only 155mm deep and has increased the spindle through hole to 70mm from 45mm of the MR200. By incorporating friction-welding procedures into their manufacturing techniques and combining this skill with their design capabilities from many years of experience Kitagawa has delivered a performance balanced new standard of rotary table to the future market. Of course, it must be mentioned that Kitagawa has other stronger (GT200) and more compact (CK200) rotary tables in their product range but the MK200 is designed to meet 90% of customers needs and in most cases will be suitably strong enough to withstand various machine cutting conditions demanded of it. After rigorous testing the MK200 adheres to the same standard of clamping torque test required of ALL Kitagawa rotary tables. The 570N.m of clamping torque is determined as the force at which 30 microns displacement of the worm wheel diameter occurs. Kitagawa determines displacement above this to be a failure as the accuracy you demand from Kitagawa tables cannot be maintained. 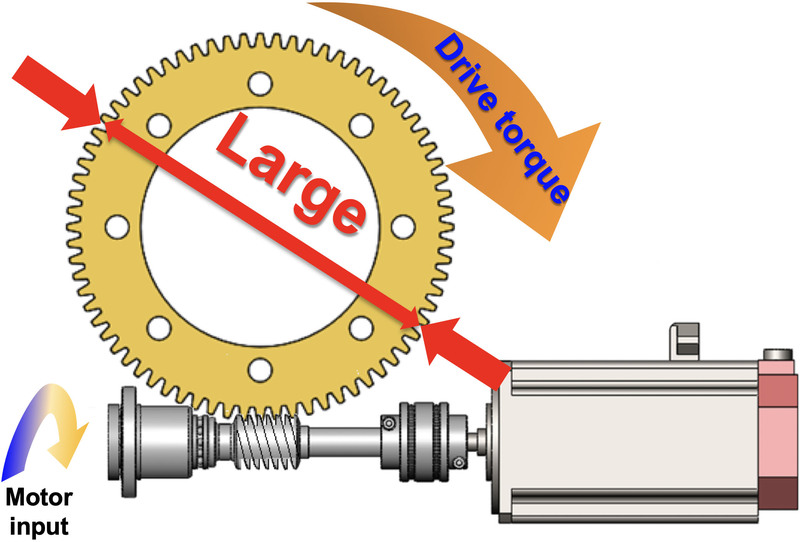 This is markedly different from many of our competitors who use the 'pull-out torque' or slipping torque figure to determine their maximum torque. Kitagawa view slipping torque as a catastrophic and dangerous failure if you have pushed a rotary table to this extreme. So you can rest assured that even if you do push your Kitagawa table to its limitations of the clamping torque indicated in the instruction manual then your Kitagawa table will maintain its accuracy where others fail. This increase to the standard clamp torque significantly increases the allowable cutting torque your machine is able to deliver to the workpiece, reducing takt time to increase your productivity. The MK200 also maintains the highest rotating/drive torque capability in its size and class of rotary table (270 N.m) due to a large worm wheel diameter design enabling you to produce complex workpieces with speed and accuracy. You will notice that the MK200 rotary table is supplied without a standard faceplate which will allow you to specify exactly what type of face plate you require - with t-slots or standard pre-drilled holes like the current MR200 rotary table. The major advantage of this is that a chuck, trunnion bed or any workholding device can be mounted directly onto the rotary table's spindle, reducing the distance from the spindle bearing. This compact assembly reduces the loading to the spindle bearing therefore increasing the rotary tables rigidity and longevity. The recessed bolt mounting design shown above is a considerable improvement to reduce the overall footprint of the MK200 compared to its predecessor the MR200. We all know that space on a machine tool bed can be extremely competitive and adding a rotary table is a big consideration. Anything that can make a rotary table take up less space to allow for more or larger workpieces to be included in the overall workholding design is an important factor when selecting your rotary table. The recessed bolt mounting allows you to mount any riser block from the top instead of from underneath (as shown above on an MR200) maintaining the reduced foot print. The MK200's overall thinner design and recessed mounting gives up to a 40% reduction in footprint size. This design also reduces chip build up around the base of the rotary table, reducing time for any cleaning cycles and ensuring no workholding system interference caused by the build up of chips. This is a very important consideration for fully automated production cells. 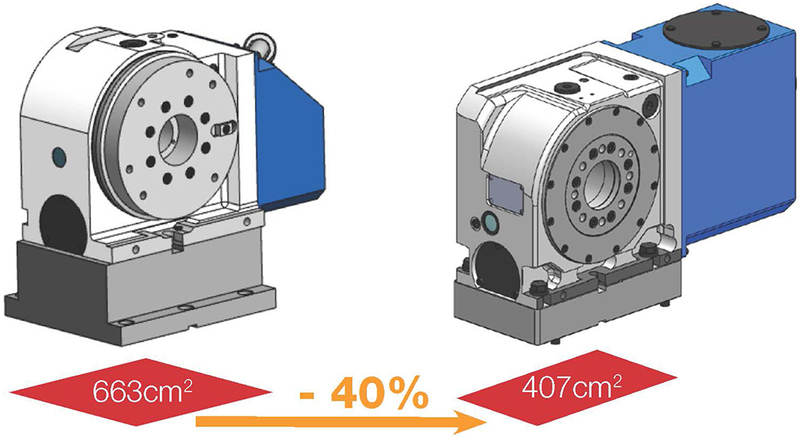 The MK200 can now accommodate 'Built-in' 6 +1 port rotary joints, compared to only 4 +1 rotary joints for the equivalent MR200. This allows for more workholding on a trunnion bed arrangement to be actuated via the rotary joint housed within the large spindle bore of the rotary table. This avoids interference issues you can encounter with tubing and wear if you have to bring the workholding actuation forward of the rotary table face. The 6+1 rotary joint also includes a 12.5mm diameter multi-purpose hole through the centre for additional air or hydraulic services and it can also be used as a wiring duct for seating confirmation sensors, enabling you to enhance any workholding designs and further increasing your workholding capabilities. Kitagawa can now provide high pressure 25 MPa (4-port and 6-port) rotary joints upon request - shown below, this will enable you to further reduce fixtures sizes and to improve clamp speeds if your design requires it.